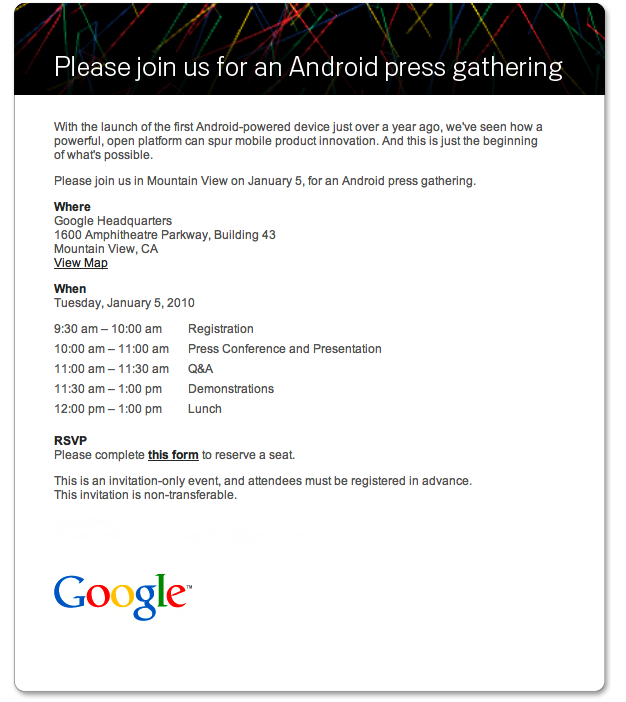 Google Inviting Press to "Android Gathering"
Next week will see Google showing off the next step in Android.Â As they put it, we’ve only seen the beginning of what’s possible with the open platform.Â All early rumors are panning out with Google widely assumed to be announcing the Nexus One with T-Mobile support on January 5th. Although we didn’t receive an invitation, we’re only too excited to share the one being passed around.Â Thanks to All Things Digital, we’re able to show you the actual invitation sent out.Â Notice the colors at the top?Â The graphics look awful familiar, don’t they? We’ll leave you with a quote from a wise man who can best sum up our feelings.